This was an OK read. Pete makes a huge ridiculous sandwich that he can't possibly eat by himself so he invites all of his friends over for lunch. My kids loved that there was an entire ice cream cone on his sandwich. 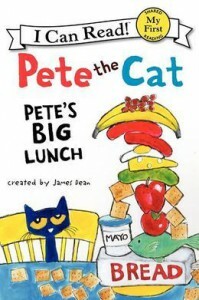 I don't get why he kept piling stuff on saying that it still wasn't enough food only to decide he wouldn't be able to eat it all.It was a fun read, but it's very different from the Pete the Cat that used to sing in his school shoes. This is basically just a mislabeled early reader that happens to have Pete in it.